During the 1930s German scientists and engineers pioneered aerial photography and developed it to high technological standards which the Allies did not attain until during World War Two. During the Second World War German reconnaissance fliers took millions of photos of the contested areas as well as of areas in enemy territory. After the War these photos fell into American hands, and have been stored in the National Archives Air Photo Library in Alexandria, Virginia, ever since. The Soviets, British and Americans also took air photos of Germany and the German-occupied territories as of late 1943. This chapter shall examine a few of these photos to see what they can reveal about the events alleged to have taken place at certain sites in connection with the 'Final Solution of the Jewish Question'. 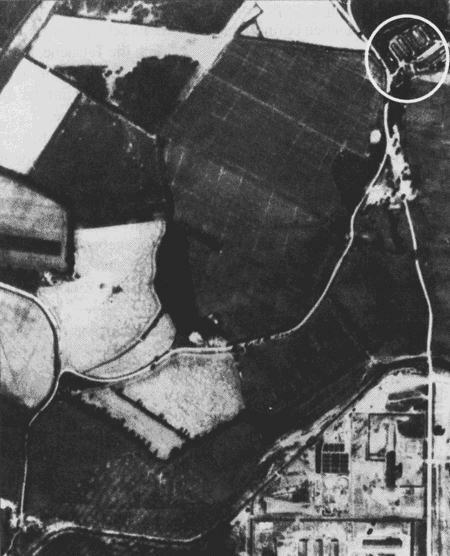 Air photo archeology was used as early as 1938 to locate the sites of medieval, ancient or even Stone Age settlements. (2) An element of vital importance to the discovery of ancient, extinct settlements is the fact that the remnants of these settlements - remnants which are generally sub-surface ie. underground today - are indicated by slight changes in topography, or even in the vegetation on the earth's surface. These minute differences can be made very clearly visible from great elevations. If, on the other hand, larger-scale disruptions of the soil involving disturbances of the vegetation and the nature of the soil date back only a few months, these changes are very easy to discern on air photos even if these disturbances have been covered up so as to prevent detection on ground level. The Allied bombing of Hamburg in late July 1943 - 'Operation Gomorrah', as the British called it - claimed more than 100,000 lives. Some 40,000 of these victims were buried in the Ohlsdorf cemetery, in four mass graves of 10,000 bodies each. (4) Each of the graves is some 130m long, 16m wide and approximately 3.5m deep (426 x 52 x 12 ft.). In spring of 1940 the Soviets shot about 25,000 Polish officers and intellectuals in a forest near Katyn and at other locations in eastern Poland, and buried them in a number of mass graves. (5) In 1943 some of them were discovered by the Germans, and investigated by an international delegation. The graves found, containing more than 4,100 bodies, covered a total area of 96m x 6m and were roughly 3.5m deep (315 x 20 x 12 ft.). In early 1945 the British established four mass graves near the former concentration camp Bergen-Belsen, to accommodate the countless typhus victims from that camp which had been dreadfully overcrowded near the War's end. (6) These graves measured about 20m x 7m x 3.5m (66 x 23 x 12 ft.) each and contained some 1,000 bodies each. As we can see, these graves mentioned above held approximately 1 to 2.5 bodies per cubic meter (1 to 2.5 per approximately 35 cu.ft.). Under realistic conditions, the maximum possible density would be roughly 8 bodies per cubic meter (10 per 44 cu.ft. ), where the top vertical 1m (3 ft.) of the grave consists only of a covering soil layer - meaning that, for a grave 3.5 m (12 ft.) deep, the greatest possible gross density is about 6 bodies per m3 (6 per approximately 35 cu.ft.). Thus, the mass graves of Katyn, Hamburg and Bergen-Belsen were not even filled to their maximum capacity. In estimating the surface area required for mass graves, it must be kept in mind that the soil excavated takes up a greater volume than the graves themselves do, due to the loosening of the soil. What is more, the material excavated can be piled up only so steeply. Postulating, for example, rectangular graves of 15m (50 ft.) width, and allowing 15m (50 ft.) of space beside each grave to accommodate the excavated material - ie. 15m + 15m, or 50 + 50 ft. breadth per grave (in fact a much too conservative estimate) - then for an excavation depth of 3.5m (about 12 ft.) and a gross density of 6 bodies per m3 (roughly 6 per 35 cu.ft.) the minimum surface area required for mass graves for a given number of bodies is indicated in Table 1. 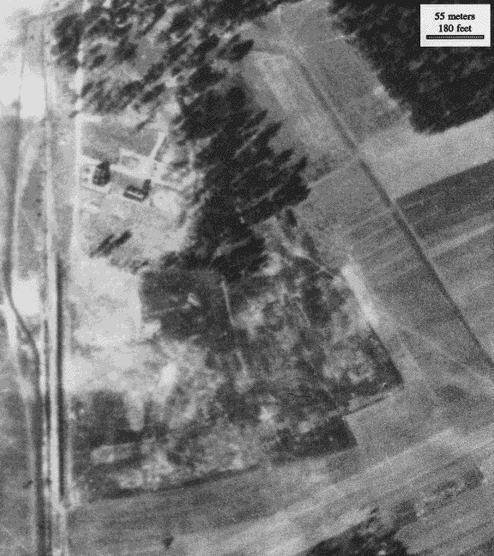 Illustration 1 shows an air photo of the Treblinka B camp, taken on May 15, 1944. (7) This is the place where, according to the standard literature, 700,000 to 1.2 million people were killed, buried in the southeastern corner of the camp, later dug up again and burned - all between mid-1942 and autumn of 1943. (8) The camp was demolished in late 1943. Illustration 2 shows an air photo from November 1944. (9) Here the area is overgrown fairly uniformly with vegetation (grass, weeds). We can see that: except in the northernmost areas, there are no signs of any remnants of building foundations. Even if these had been removed, the vegetation would not grow as well over these areas. The massive concrete gas chamber buildings attested to by witnesses were not present here; at most, there may have been temporary barracks without stone or concrete foundations; large-scale movements of the soil and mass cremations in the southeastern part of the camp would have resulted in poorer growth of vegetation there than elsewhere in the camp, due to the destruction of the topsoil ie. its mixing with deeper soil layers. Since this is not the case, disturbances of the soil as well as cremations can be ruled out for this area of the camp. The same goes for the surrounding agricultural areas; contrary to witness accounts, no trees or bushes were planted on the camp grounds for camouflage purposes. Much like Treblinka, the Belzec camp could easily be looked into from the nearby rail line and road. The town of Belzec was located about 1 mile north of the camp, which had been built on a hillside, into the forest. Air photos from 1944,(11) in other words from after the camp was dismantled, show that the area of the camp where witnesses claim mass graves containing some 600,000 bodies as well as their later cremation sites were located, had an area of approximately 7,000m2 (75,300 sq.ft.). No more than 70,000 bodies could thus have been buried there - provided that the rocky soil would even have allowed for the excavation of 12-ft.-deep graves in the first place. There is no evidence of any foundations from former buildings, nor of any large-scale movements of the soil or of mass cremations. There are no signs of any such activity anywhere in the surrounding area either. It is claimed that in Sobibor 100,000 of the total 150,000 victims were buried before being exhumed later and being cremated along with the rest of the victims. 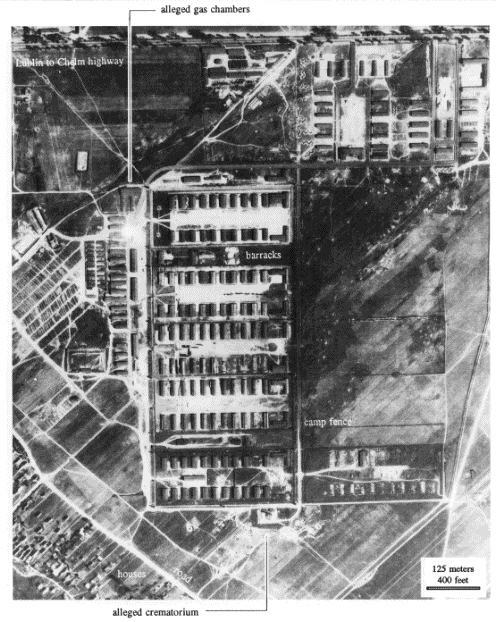 The air photo from 1944,(12) also taken after the camp was dismantled, shows this camp as having covered an area of roughly 50,000m2 (12.4 acres). Some 10,000m2 (107,600 sq.ft.) - fully 1/5 of the total camp area - would have been needed to bury the victims. However, the air photo shows that the ground in the camp area was not disturbed. There are no signs of former building foundations, large-scale movements of earth, or cremation sites. The Majdanek camp is located at the outskirts of the city of Lublin. Just as for Treblinka, the surrounding fields were cultivated right up to the camp boundary. The alleged gas chambers and the crematorium were outside the camp proper, openly visible and accessible to thousands of people living in the suburbs of Lublin. It is said that after the city of Kiev was occupied by German troops the Jews of this city were taken to Babi Yar, a ravine at the northwestern edge of the city, near the Jewish cemetery. According to eyewitness accounts, they were shot there, thrown into the ravine, and buried - according to some witness statements, the ravine was also blasted and the bodies buried under the rubble. 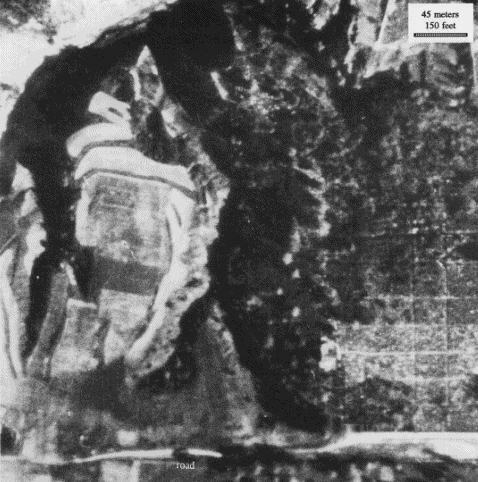 Illustration 7 shows the ravine of Babi Yar on an air photo taken by the Luftwaffe on September 26, 1943. (14) The part of the ravine (near the Jewish cemetery) where the massacre allegedly took place is shown as enlargement in Illustration 4. What we see is in fact a placid and peaceful valley. Neither the topography nor the vegetation has been disrupted by human intervention. There are no access roads for the transport of humans or fuel, no fuel depots, no excavations, no burning sites, and no smoke. We may conclude with certainty that no part of the Babi Yar ravine was subjected to topographical changes of any magnitude during the war years right up to the Soviet reoccupation of the area. The vegetation in this valley was also not disturbed. (15) Hence, there can have been no mass graves in these locations, and the mass cremations attested to can also not have taken place at this time. The Americans took many series of photographs of the Upper Silesian industrial area, and some of them are of excellent quality. Unfortunately, the Auschwitz-Birkenau camp group is shown on only about half a dozen photos, all of which are of mediocre or poor quality. One qualitatively excellent sequence of photos from June 26, 1944 breaks off just before Auschwitz. 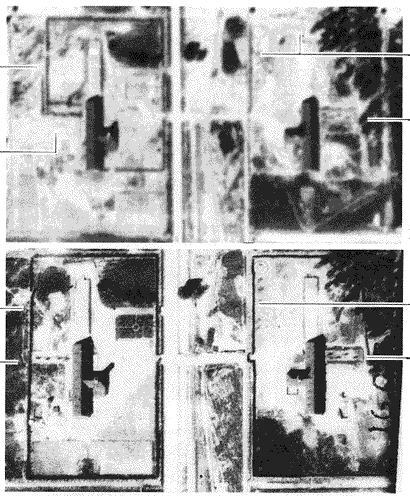 While it is possible that the cameras were turned off immediately after the plane flew over the main point of interest, namely the synthetic rubber plant in Monowitz, it seems more probable that these photos of excellent quality and resolution were in fact removed before the public could view them. We shall see the grounds for this supposition in the following. First of all, it is interesting that in Birkenau, as well, the surrounding fields were cultivated right up to the camp boundary, which would have defeated any attempts to keep events in the camp secret. In this context I would like to draw special attention to two August 25, 1944 photos of the Birkenau camp. (17) These photos were taken within 3.5 seconds of each other, which allows for three-dimensional viewing through a stereoscope. Let us take a look at the first of the two pictures. Illustration 9 is an enlargement of the detail around Crematoria II and III. Illustration 10 is a schematic diagram of this photo section. The CIA identified the patches on the roofs of Mortuaries I of the two crematoria as input hatches for Zyklon B. Even without three-dimensional viewing one can see that these patches on the roofs cannot be input hatches: the alignment of the patches does not agree with the direction of the shadow cast by the crematorium chimney; on a photo from September 13, 1944, the patches on Crematorium III retain their direction and shape even though the position of the sun has changed;(18) on that same photo the patches on Mortuary I of Crematorium II are missing; the length of the shadows corresponds to input hatches 4.5 ft. wide and rising 10 to 13 ft. above the roof - in other words, large chimneys, not the approximately 20-inch-high hatches attested to by witnesses; these jagged, irregular patches cannot be shadows cast by perpendicular, straight input hatches. (NOTE: The drawing in Illustration 10 was prepared from a doubly reversed print, but all details of angle and dimension are correct. The buildings should be flipped both horizontally and vertically to be in a position to match the photograph. Illustration 11: Schematic of the roof of Krematorium II. Existing holes in the thick steel reinforced concrete slab roof are shown circled. The rest of the roof is solid, there are no openings for the alleged four Zyklon-B entry ports. 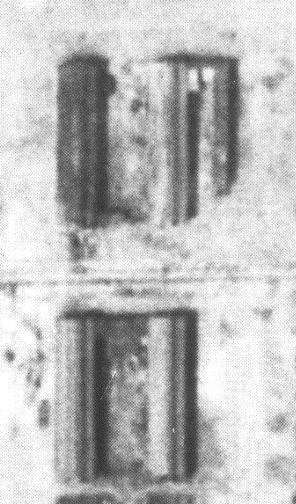 Illustration 11, an enlarged section of Illustration 9, reveals the discrepancy between the holes actually present in the roof of Mortuary I of Crematorium II and the patches added to the photo by the forgers. The location and size of the real holes, marked with a circle, do not correspond to the patches added. According to the CIA, the dark line surrounding both Crematoria II and III was a wall or hedge intended to guard against prying eyes and to prevent attempted escapes. From a vast number of original, ground-based photos of the camp, however, we know that the Crematoria were separated from the rest of the camp merely by a wire mesh fence, which would not show up on an air photo. 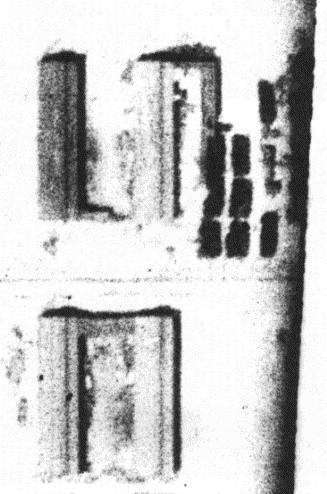 (20) On a photo of May 31, 1944, these dark lines around Crematoria II and III were only incompletely drawn in. (20) The same goes for the lines drawn around Crematoria IV and V only on the photo of September 13, 1944. Viewing these pictures in 3-D, one realizes that neither the alleged wall nor the patches on the mortuaries have any elevation. What is more, the overly dark color of such narrow objects proves that what we have here is an instance of photo-retouching. Illustration 12 is another enlargement from Illustration 9. In this picture patches were added which, according to the CIA, represent groups of inmates. In this context one must consider that a group of inmates is not a massive block structure which could cast darker shadows than, for example, the barracks beside them. More than likely, therefore, the picture was "helped along a little" here. This assumption is proven by the fact that some of these "groups of inmates" are evidently marching across the roof of a barracks - a physical impossibility. This is shown clearly by the photo of September 13, Illustration 13, where the barracks is also clearly visible, but this time without inmates marching across it. See below. Illustrations 14 and 15 show enlargements of details of the two aforementioned photos taken in rapid succession on August 25, 1944. According to the CIA's interpretation this shows a group of inmates on their way to the gas chambers. First one should note that in the 3.5 seconds separating the two exposures, the group of inmates has advanced fully 40 feet, corresponding to a speed of 7.5 mph, in other words, running. That civilians could manage to move that quickly while maintaining a prescribed formation is already highly unlikely; but what is most interesting is the manner in which this group of inmates moves (Illustration 16): it moves in a zigzag - in a line added by a clumsy retoucher. After realizing these facts of the matter, I went to the National Archives and requested to see the originals, since the photos given to me as originals had clearly been altered. And in fact I was then given air photos which I was assured were the originals. These were indeed of better quality than the negatives I had been given first: due to the better focus, the work of the forgers was considerably more clearly apparent at the same places on the photos. When I pointed this out to the Archives staff, I was told that these were the negatives which the National Archives had received from the CIA in 1979, and that they had always believed that they were in the precise state in which they had been taken out of the reconnaissance planes in 1944. I was told that I was the first member of the public ever to have seen these negatives. Now they would be returned to the archives forever and be handed out only on the request of government agencies such as the CIA. In light of the poor quality of the forgeries on these air photos it is not likely that the alterations were added by a government agency or by the CIA itself. These authorities have highly qualified staff and advanced technology at their disposal and would have produced forgeries that were perfect, or at least very difficult to expose. 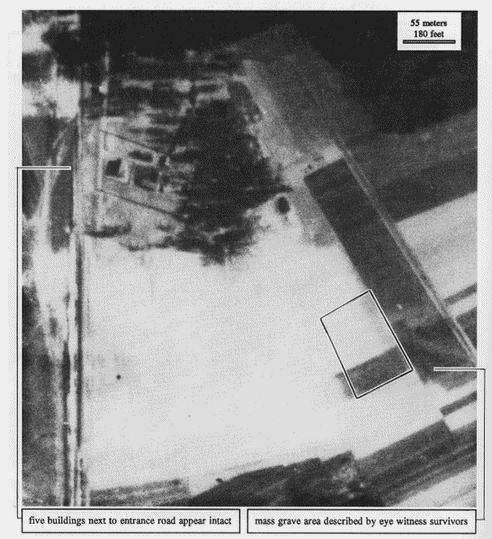 To the immediate north of the Birkenau camp, near the presumed location of the so-called Bunker I, the air photos reveal rectangular patches which may perhaps stem from old, filled-inmass graves (Illustration 18, right). (21) Their surface area totals approximately 3,600m2 (38,700 sq.ft.). West of the camp, more rectangles are visible, standing out from their surroundings due to their lighter coloring (totalling about 450m2, or 4,800 sq.ft., see Illustration 18, top). If one assumes that the patches north of the camp are mass graves, that these were 3m (about 10 ft.) deep with a 1m (3 ft.) covering soil layer, and that mass graves have a capacity of at most 8 bodies per m3 (10 per 44 cu.ft. 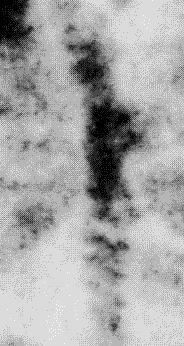 ),(22) this indicates a maximum of about 55,000 bodies that could have been contained therein. If Czech's statements regarding the opening of mass graves in September 1942 are correct, it seems quite plausible that from this time on until the new crematoria were put into operation in spring/summer 1943, there were indeed open-air funeral-pyre cremations of old, partially decomposed corpses. This work, which was likely performed by inmates, might represent the factual basis of greatly exaggerated and highly embellished eyewitness statements about perpetual, gigantic mass cremations on pyres and in deep pits. 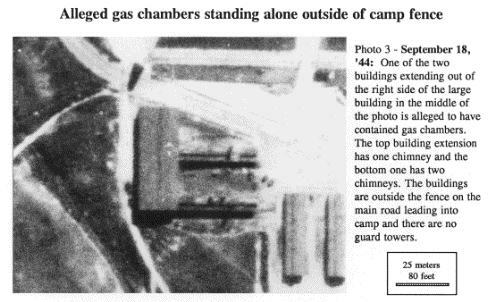 These witness statements generally place the open-air cremations in pits located behind Crematorium V and west of the camp on a meadow near Bunker II,(27) a former farmhouse allegedly renovated to serve as gas chamber. In the process, it is claimed, the great quantities of smoke emanating from the burning sites swathed the camp in dark clouds. (28) Particularly from May to August 1944, during the time of the alleged destruction of the Hungarian Jews and the Jews from the Lodz ghetto, fires are said to have been burning in the fire pits day and night. 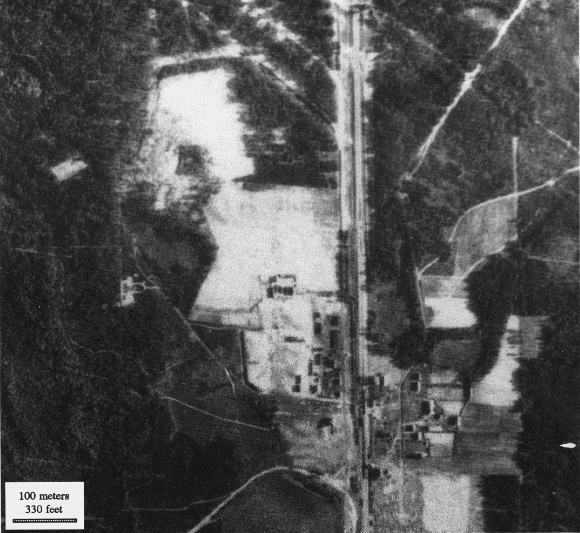 (29) But the air photo of May 31, 1944 is the only one to show even relatively small drifts of smoke rising behind Crematorium V.(30) Nothing even remotely similar is to be found at any other place, nor on any other photo: there are no considerable quantities of smoke issuing from the chimneys, none in the vicinity of Bunker II, none anywhere else. The photo from September 13, 1944 is the only one to show any large smoke clouds at all, and these have drifted in from the surrounding industrial establishments which the Allies had just bombed. 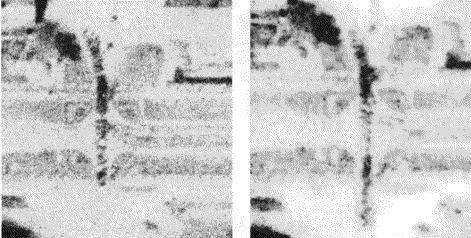 Professor G. Jagschitz's theory, proposing that perhaps the Allies had used filters that resolved the smoke on the photos,(31) is not even close. Smoke cannot be resolved by optical filters; at best, one could use film that is sensitive to a specific range of the electromagnetic spectrum which the smoke does not absorb. This, however, would have required a homogeneous and known composition of the smoke, as well as highly advanced technology at the Allies' disposal at the time. Neither factor is given. The Allied air photos were taken with perfectly normal, simple black-and-white film. If there are no smoke clouds visible on the photos, then there were no incinerations to cause them. Further, in light of the absence of any pits, pyres, fuel depots and heaps of corpses it is downright irrelevant whether the smoke might have been visible or invisible, since there was nothing that could have caused it in the first place. Filters to render fuel depots, burning pits, heaps of corpses etc. invisible have yet to be invented, even today. The mass graves of Hamburg, Katyn and Bergen-Belsen demonstrate how great the area requirements are for mass graves. Due to the area required for the excavated material, which in realistic terms is much greater than the theoretical minimum areas calculated in Table 1, 10,000 bodies need at least 4,000m2 (43,000 sq.ft.). Treblinka Mass graves for the alleged 700,000 to 1.2 million victims of this camp would have required 40 times as much space as the witnesses state was available. The ground in the camp area shows no traces of former building foundations, large mass graves or burning pits. As in the case of Treblinka, it would have been impossible in Majdanek or Belzec to keep any mass murder secret; the close proximity of settlements and roads, and the cultivation of surrounding farm land right up to the camp fences, saw to that. In no case is there any evidence for mass graves or burning pits. Babi Yar The ravine of Babi Yar underwent no noticeable changes in topography or vegetation up to the end of the War. There are no signs of human intervention during the time of German occupation. There was no human activity there at the time of the mass cremations attested to by the witnesses. 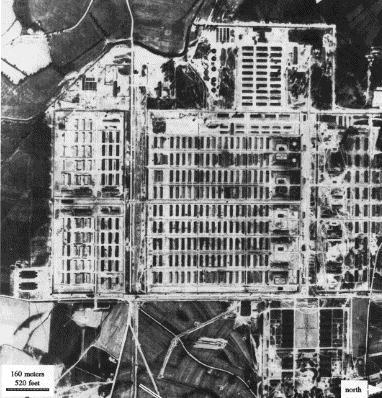 The few air photos of Auschwitz-Birkenau known to date from the period of December 1943 to February 1945 show no signs of fuel depots, smoke from chimneys or open fires, burning pits or pyres. The photos were altered: Zyklon B input hatches, groups of inmates, and walls around crematoria were retouched onto the photo negatives. Insofar as they still exist, photos of good quality are being kept from the public. One must assume that any actual mass murder activities would not have escaped the notice of the air photo interpreters. This would have resulted in the bombing of the camp - which, however, was carefully refrained from. To this day there is no air photo evidence to support the alleged mass murder of the Jews at any location in Europe occupied by the Germans during World War Two. 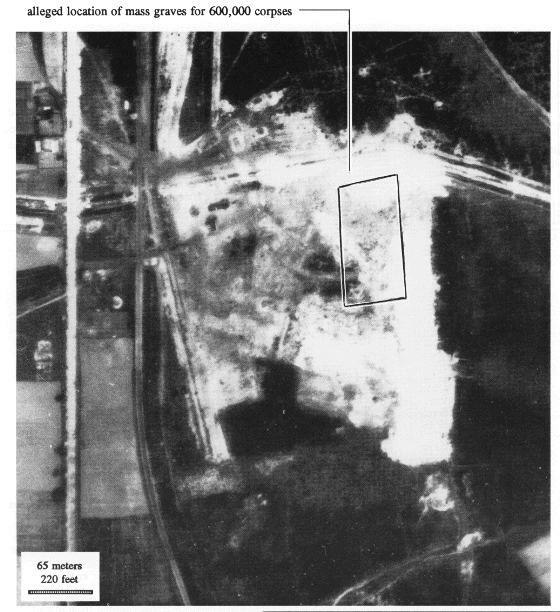 Further, air photo analysis refutes the claim that the Nazis had intended, at whatever time, to keep events in the alleged extermination camps secret. 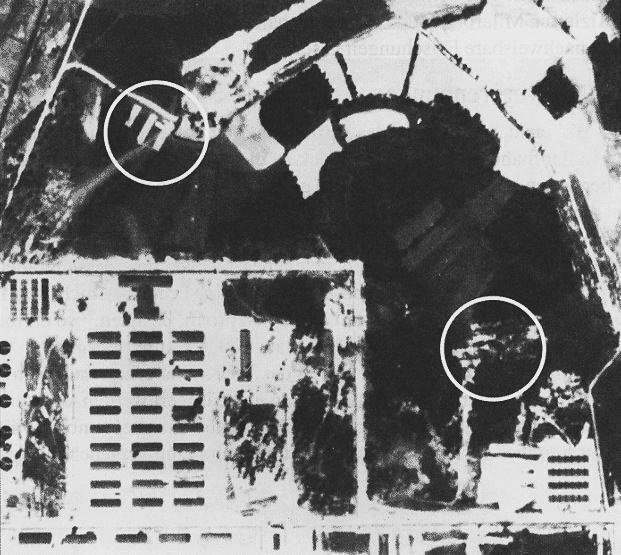 In many cases the air photos provide clear proof that some of the events attested to by witnesses, such as the destruction of the Hungarian Jews or the mass executions at Babi Yar, did not in fact take place. We may hope that the release of Soviet air photos dating from the time the camps were in operation will shed further light on these issues. The fact that these photos have not been published to date may already speak for itself. That the photos in Western hands were altered in order to incriminate Germany, and were first published by the CIA, is also very significant indeed. (1) Due to the photomechanical reproduction process, some of the pictures shown in this chapter are unfortunately of considerably poorer quality than the originals, so that they no longer show all the details which are clearly visible on the original exposures. (2 ) cf. O. G. S. Crawford, "Luftbildaufnahmen von arch�ologischen Bodendenkm�lern in England", in: Luftbild und Luftbildmessung No. 16, Berlin: Hansa Luftbild, 1938, pp. 9-18; cf. also: J. Dassi�, Manuel d'arch�ologie a�rienne, Paris: Editions Technique, 1978; L. Deuel, Flug ins Gestern - Das Abenteuer der Luftbildarch�ologie, Munich: C. H. Beck, 1977. (3) For the air photos the reader is referred to my report: J. C. Ball, Air Photo Evidence, Ball Resource Services Ltd., Suite 160-7231, 120th St., Delta, BC, Canada, V4C 6P5, 1992. (4) M. Caiden, The Night Hamburg Died, New York: Ballantine Books; M. Middlebrook, The Battle of Hamburg, London: McMillan; D. Irving, Und Deutschlands St�dte starben nicht, Zurich: Schweizer Verlagshaus, 1967. (5) F. Kadell, Die Katyn-L�ge, Munich: Herbig, 1991; J. Lauck, Katyn Killings: In the Record, Clifton, NJ: Kingston Press, 1974; A. Paul, Katyn, The Untold Story of Stalin's Polish Massacre, New York: Charles Scribner's Sons, 1989; W. Anders, The Crimes of Katyn, Facts and Documents, London: Polish Cultural Foundation, 1965. (6) S. Bloch, Holocaust and Rebirth: Surviving Bergen Belsen, New York: Holocaust Library, 1972. (7) Ref. No. GX 120 F 932 SK, exp. 125. (8) cf. the chapter by A. Neumaier, this volume. Also: U. Walendy, "Der Fall Treblinka", Historische Tatsachen No. 44, Vlotho: Verlag f�r Volkstum und Zeitgeschichtsforschung, 1990. (9) Exact date unknown, Ref. No. GX 12225 SG, exp. 259. (10) For these camps, cf. : Y. Arad, Belzec, Sobibor, Treblinka: The Operation Reinhard Death Camps, Indiana: University Press, 1987; E. Kogon, H. Langbein, A. R�ckerl et.al. (eds. ), Nationalsozialistische Massent"tungen durch Giftgas, Frankfurt/Main: Fischer, 1983; E. J�ckel, P. Longerich, J. H. Schoeps (eds. ), Enzyclop�die des Holocaust, Berlin: Argon, 1993. Due to space limitations these three camps were only briefly mentioned here. For details cf. J. C. Ball, op. cit. (Note ). (11) Ref. No. GX 8095 33 SK, exp. 155. (12) Ref. No. GX 191 F 910 SK, exp. 122. (13) cf. the chapter by H. Tiedemann, this volume. (14) Ref. No. GX 3938 SG, exp. 104 and 105. (15) This statement can be documented with further air photos showing the valley prior to the war and again after Soviet reoccupation: the vegetation in the valley has grown, but nothing else has changed (May 17, 1939: GX 988 - exp. 48, 49; April 18, 1944: GX 4793 SK - exp. 39, 40). Due to space limitations we have dispensed with showing these pictures here, and chosen one instead that shows the location during the time of the attested-to mass exhumation and mass cremation. (16) D. Brugnioni, R. Poirier, The Holocaust Revisited: A Retrospective Analysis of the Auschwitz-Birkenau Extermination Complex, Central Intelligence Agency, Washington, 1979; cf. W. St�glich, Deutschland in Geschichte und Gegenwart 27(3) (1979): 10-14. (17) Ref. No. RG 373 Can F 5367, exp. 3185 and 3186. (18) Ref. No. RG 373 Can B 8413, exp. 6V2, J. C. Ball, op. cit. (Note ), p. 65. (19) cf. J. C. Ball, ibid., pp. 45, 63; S. Klarsfeld, The Auschwitz Album, New York: Beate Klarsfeld Foundation, 1980; the fence has partially survived to this day: J.-C. Pressac, Auschwitz: Technique and Operation of the Gas Chambers, New York: Beate Klarsfeld Foundation, 1989. (20) Ref. No. RG 373 Can D 1508, exp. 3055, J. C. Ball, op. cit. (Note ), pp. 52, 64. (21) Details from air photo, op. cit. (Note ). (22) cf. the chapter by A. Neumaier, this volume. (23) D. Czech, Auschwitz Chronicle, 1939-1945, New York: Henry Holt, 1989, pp. 108, 242, 275. (24) cf. J.-C. Pressac, Les Cr�matoires d'Auschwitz, la Machinerie du meurtre de masse, Paris: CNRS, 1993, pp. 144ff. (25) cf. the chapter by C. Mattogno and F. Deana, this volume. (26) Some time ago the Polish firm HYDRO KOP carried out drillings in Birkenau at the sites where, according to witnesses, mass graves and/or burning pits had been located. A few parts of the report based on these drillings have been published by U. Walendy in Historische Tatsachen No. 60, Vlotho: Verlag f�r Volkstum und Zeitgeschichtsforschung, 1993. According to this report, charred wood as well as bones and hair were found at some points. A correct interpretation, however, would require access to the entire report. Also, the fragments of the report which are available fail to specify the exact location of the drill sites. (27) It is claimed that there was another farm house (Bunker I), but its exact location is unknown. It is not visible on any air photos, and so it will not enter into this discussion. It is alleged to have been located at the place where the aforementioned traces of possible mass graves are detected. (28) Aside from E. J�ckel et.al. and E. Kogon et.al., op. cit. (Note ), cf. also: D. Czech, op. cit. (Note ), passim. (29) cf. J. S. Conway, "Der Holocaust in Ungarn. Neue Kontroversen und �berlegungen", Vierteljahrshefte f�r Zeitgeschichte 32 (1984): 179-212; J. Wulf, "Lodz. Das letzte Ghetto auf polnischem Boden", Aus Politik und Zeitgeschichte 10(42) (1960): 675-694; cf. also F. Piper, Die Zahl der Opfer von Auschwitz, Auschwitz: Verlag Staatliches Museum Oswiecim, 1993, pp. 52, 69, 119ff. (30) May 31, 1944, op. cit. (Note ). (31) Transcript of the report of Prof. G. Jagschitz, 3rd-5th day of the trial of G. Honsik, April 29 and 30, May 4, 1992, Ref. 20e Vr 14184 and Hv 5720/90, District Court Vienna, p. 478 of the transcript.